After a long summer of use, a bird bath can be getting pretty grimy this time of the year. It is easy to clean a cement bird bath to make it a safe and fun place for birds to enjoy. All you need are a few common supplies and minutes of your time. I admit it. I am not the best housekeeper in the world. I’d rather spend time in my garden. But even normal gardening chores have piled up on me this summer. My only child made a move across the country and there have been so many things to do to get her ready for the move. The extra time gives me a chance to take care of things that I have neglected, like this dirty bird bath. 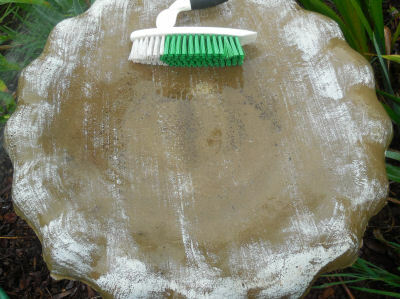 How to Clean a Cement Bird Bath to Encourage the Birds in your Garden. Now that she has gone, I have to get my “nest” back in order. And cleaning out my bird is at the top of my list. The poor birds have abandoned me because I let it get so dirty. The above scene is lovely but a close up shows just how disgusting the bird bath had gotten over the last month or so since I cleaned it out. Allowing a bird bath to become very dirty makes it a breeding ground for mosquitoes and discourages birds from using it. It is important to remove the debris in the bird bath. The water contains an accumulation of all sorts of bacteria and debris, including bird feces. To remove the water, I just tipped it slightly on its side and let the water run into the surrounding garden. This close up shows just what needs to be removed. The next step is to use the hose to remove what you can. I used the highest pressure setting on my hose and then scrubbed the bird bath with a scrubbing brush. Surprisingly, I got a great deal of the dirt out just doing this! It looks reasonably clean but you can still see some residue that the brush did not get. 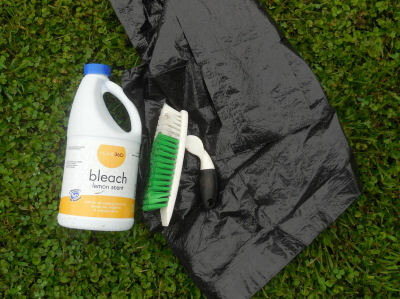 To get it cleaner you will need these items: A black trash bag and some liquid bleach. The next step to clean a cement bird bath is very important. Refill your bird bath. Bleach is highly toxic and needs to be diluted. I used about 3/4 cup to a gallon of water. Fill the bath up above any stain marks and add the bleach. At this point, the bath will need to be left for about 15-20 minutes. (longer if it is very dirty.) 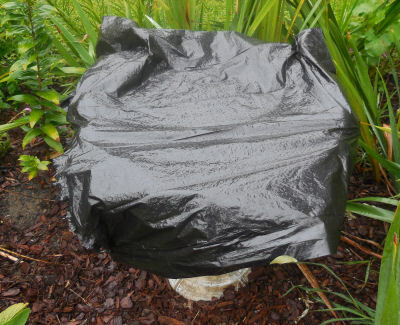 Cover the whole bird bath with a black plastic bag and leave it to sit. This black bag step is necessary because the water in the bath will be attractive to birds now that it is clean and you don’t want them to be drinking the diluted solution. When you remove the plastic bag, your bird bath should look like new. If it still has algae or scum in it, just replace the bag for a bit longer. You can save the plastic bag to use again the next time you need to clean your bird bath. Drain out the water. I used old sponges to sop it up and put into a pail to discard. I did not want the chlorine bleach to get onto the nearby plants. Once you have removed the chlorinated water, be sure to rinse the bath thoroughly. Once again, I used the pressure setting and let the water run into it for about 2 minutes. Tilt the bath and be sure to get every part of the bird bath rinsed. You will have a good idea if you have rinsed enough by smelling the bath. If you can smell chlorine, keep rinsing. It is a good idea to let the bird bath dry in the sun for a while before putting in fresh water. This will help to sterilize the surface of the bird bath against bacteria. The basin will dry in just a few minutes on a hot sunny day. This step is not crucial but is a good idea. Now refill with clean fresh water and your bird bath is clean and safe for your birds to enjoy. The bath will remain clean for several days and you can help to keep it clean longer by pressure rinsing and refilling the bath daily. With proper care, you will only need to occasionally use the bleach method. Hopefully, mine will not get to the awful state shown above for a long time to come! Much better than the picture above, don’t you think? 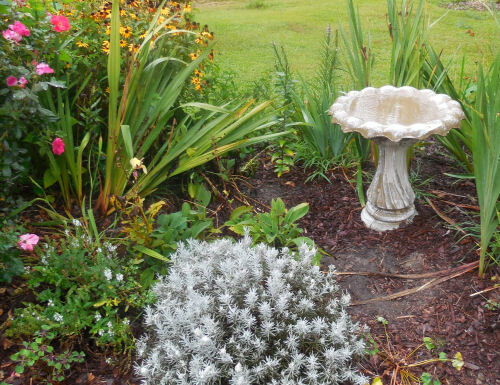 There are a few things that you can do to ensure that the bird bath doesn’t get so dirty in future. Position your bird bath so that it is not under bird feeders or woody trees which will allow debris and seeds to get into the water. You can position it near a feeder but not under it. Place your bird bath in a sunny position. Sunlight kills bacteria spores more quickly than shade does. Change the water daily to prevent build up of algae. Bird baths with a fountain pump as part of the design keeps the water moving which helps with cleanliness. This a discourages mosquitoes. 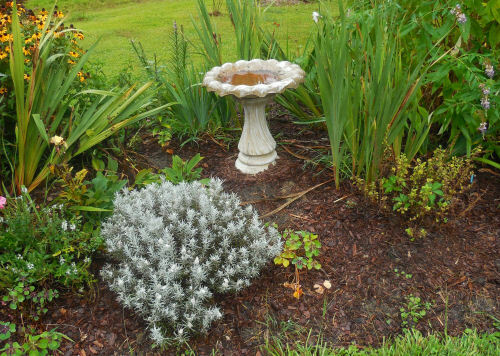 A heater in your birdbath in the colder months will help to keep it cleaner. Biodegradable balls (available at hardware stores) are designed to keep algae out of ponds. These can also help to keep birdbaths clean if it has a large bowl area. Bird bath enzymes work well in small areas like a bird bath to keep them clean. 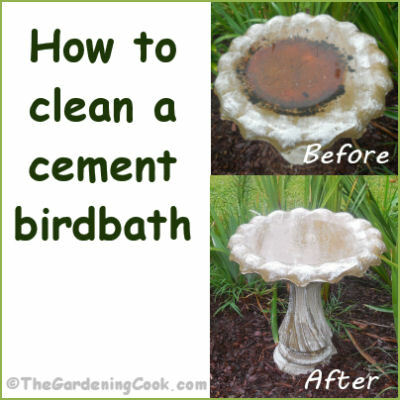 There are lots of other ways to clean a cement bird bath. I also tested alka seltzer and copper pipes recently. See my test results on this method here. 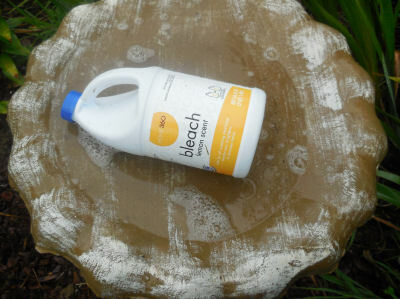 If you don’t like the idea of using bleach, white vinegar and water does a pretty good job of cleaning a bird bath, but it does now kill the pathogens. How do you keep your bird bath clean? Please leave your suggestions below. 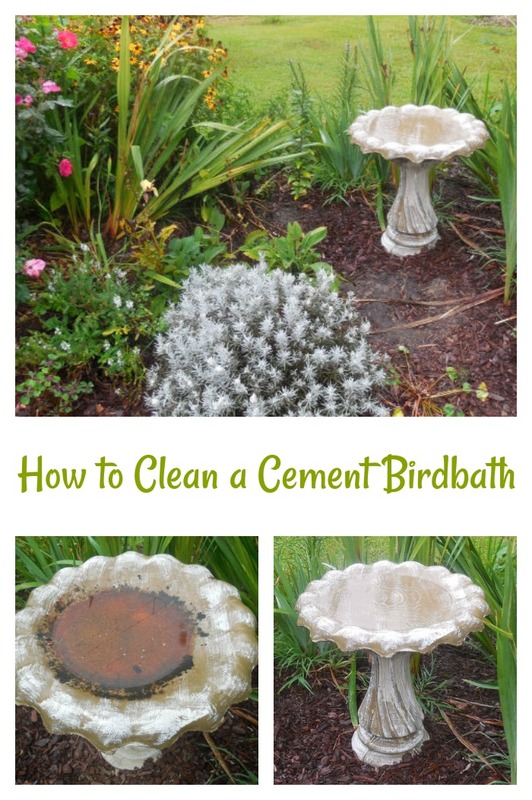 Would you like a reminder of these tips for how to clean a cement bird bath? Just pin this image to one of your gardening boards on Pinterest, Admin note: this post for tips to clean a cement bird bath first appeared on my blog in August of 2013. I have updated it to include some new photos and tips for keeping the bird bath clean. I like your solution and the step-by-step photos, but I do think you can accomplish this with less than 3/4 cup of bleach. I worry that the bleach will leach into unsealed cement, and the more you use, the more will remain in there and will end up in the clean water. You do need to rinse and rinse after the soaking anyway, but try this with 1/4 cup instead of 3/4. Your results should be the same. Thanks for the tip. One article I read recommended 1 cup and I thought that was too much, so I reduced it. My bird bath was horrible so I figured I needed quite a bit. When I clean it in future, I will use less though. 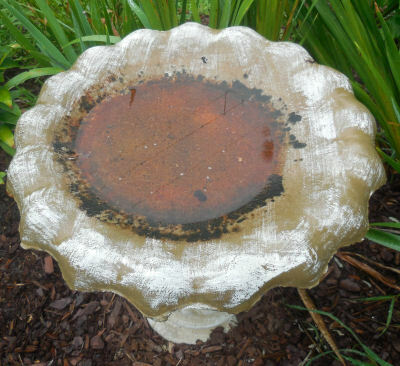 clean birdbath withone part bleach to ten parts water or 50/50 vinegar and water, then rinse,rinse and rinse again. Refill with fresh water and add a commercially available enzyme that prevents stains, scrum, mineral deposits and organic contaminates. Just add a capful of the enzyme to water, also safe for wildlife. Moving water is a bird magnet, add a dripper, mister or water wiggler. All birds need water !!!!!!!!!!!! After I cleaned my bird bath (I used a scrub brush, baking soda and vinegar), I added a bunch of pennies that were dated prior to 1983 (the copper keeps the bird bath clean from algae). So far, so good! Hi, I went into my local birding store to see if they had some specific cleaner that I could buy. The owner happened to be there and was worried about using any chemicals, so he suggested his method: Hydrogen peroxide. He swore by it, just let it set and of course rinse well after a scrub with a brush. I also cover my bath during it’s treatment. Seems to work great! Thanks for the tip Susan. I’ve also heard that hydrogen peroxide is a good way to go. I use a pressure washer to clean my birdbath from top to bottom. No cleaners or scrubbing….clean in 10 minutes. Clean my 4 tier fountain the same way….clean in 15 minutes. Thanks for the tip. I wish I had one. The edges of my roof could do with a good clean too! You could also use OxyClean or Stain Solver (oxygen bleach). It’s safe for the plants and won’t bite into the concrete. I noticed the first year I tried this the green slime does not build up on my fountain as quickly. I’ve also been amazed that the slime did not build up on my bath using the method I outlined above. Thanks for your tips. My main concern is for the birds, so I keep the chemicals part as low as I feel I can get away with. I have also used just builder’s sand. Rubbing it into a dry bird bath helped removed a lot of the discoloration and no problem for the plants below, plus no residue needing copious amounts of rinse. Thanks for the tip Judy. Judy, thanks for the tutorial. The photos were very helpful. 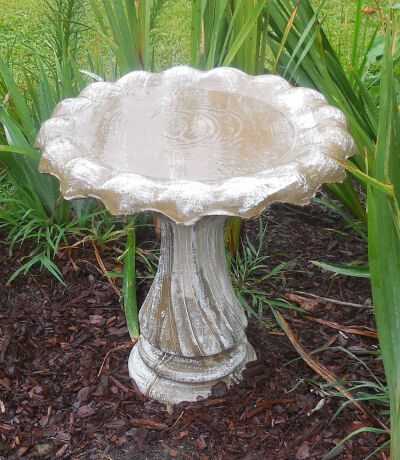 For years I’ve seen some beautiful antique bird baths at estate sales, and really wanted to buy them, but always shied way from pulling the trigger because I was afraid that the stains might be permanent. Now I feel free to go ahead and take the plunge. Thank you! I would like to try hydrogen peroxide to clean the birdbath but am unsure how much to use and how to apply it. Any suggestions would be appreciated. Before you fill it, each time, pour in about a half a cup of hydrogen peroxide around the sides and on the bottom so it is all coated. Then add the water. The extra oxygen in the hydrogen peroxide ( it is water with an extra atom of oxygen attached to each molecule) quickly dissipates in the rest of the water and is completely safe for the birds. 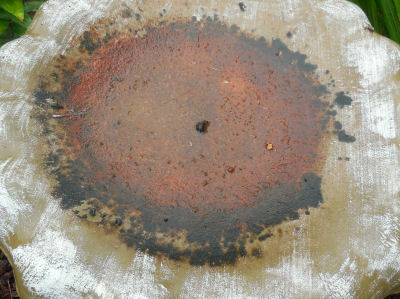 You may well see some ‘bubbling’ as the hydrogen peroxide first hits the sides and bottom of the birdbath. That means it has found something to ‘eat up.’ Then it becomes just water after that, because that bubbling uses up the extra oxygen. I can’t vouch for this info but it seems as though it would work. Just not sure about putting it in an not rinsing. Perhaps another reader will have some advice? Thanks for the information on cleaning bird baths, plus so much more useful tips for caring for a home and garden. The pictures are lovely and my kind of activities , like antiquing and refubishing things. Thanks for a lot of great info. I just bought the exact bird bath that you have pictured above. Hasn’t been used in some time. It has a few small cracks superficial but worried it could crack more with use. Can I do something to keep cracks from getting worse and can I paint with something safe to protect the concrete from deteriorating? HI Sue. To be honest, I am not sure about that. I have never cracked mine, so I don’t know what one would use to fix it. I did a search for this issue and came up with this article: http://homeguides.sfgate.com/seal-concrete-birdbath-52526.html. But I can’t vouch for it, since I have not tried this. Love your site, my birdbath is sparkling. To keep algae growth down and your bird bath clean, add 1 capful of apple cider vinegar or 1 teaspoon per gallon of water to the bird bath. The apple cider vinegar also provides vitamins & minerals to the birds. I cleaned my cement bird bath using 50/50 vinegar and water then used a brush to remove the dirt that had accumulated over the winter. I have never had it that clean before. No chemicals required. Beautiful results. Thanks for sharing the tip Robin. Hi Robin! I like the idea of using vinegar…something natural. Do you use white vinegar or apple cider vinegar? Thank you! Would it be a problem if I let the birdbath soak overnight? Wow, it’s only been 15 minutes, and already a huge difference, thank you….it was a lot of money I spent on this bird bath, and it’s back to looking like the day I bought it. I’ve never used a bird bath before. One came with my new home and I never used it. Today I decided to put it in a place it looked good but it was so dirty I didn’t know if I could use it. Thank God I found your instructions. I am now so excited!! I’m going to buy the supplies and get to pleasure 🙂 Thank You, Thank You Thank You!!!!!! I had a bird bath that came with my home. It was in the garden for over 10 years. I moved and decided to take it with me. Today I finally put it in my garden. It looked good except it was extremely stained and dirty ( of course, being outside with no care ). Thank God I found your instructions. I am so excited and am ready to get to FUN!!! You can get 3 percent hydrogen peroxide from the dollar tree. A cheap paint brush , a cheap bucket, you can clean up all of your yard tool and trinkets. I think of it as my clear soap safe for the enviroment. I clean me up outside also. especially my mosquito/bug bites. I’ve been cleaning my bird bath for years using bleach; but keeping that way was the challenge. Back in “the day” the old timers used a product called Bluing to brighten their white clothes. It is totally non-toxic, beautiful in color, and recommended for keeping bird baths clean. I tried it and IT WORKS! Bluing can be ordered from the Vermont Store or I got mine in Kroger. After cleaning your bird bath fill it with clean water; add a couple drops of bluing and throw in a copper penny and your good to go for a couple weeks! Thanks for the tip Karen. This is good to know.